After three long years of deliberation, random frugality, and calculated saving up, 38-year-old school teacher Sanjib and his wife Anjali were finally ready to buy their first home in 2019. They decided to apply for a home loan and had plans to avail the PMAY CLSS scheme for MIG homebuyers. But fate has a way of messing up our plans and that’s exactly what happened to Sanjib and Anjali’s dreams of homeownership. They had barely started home hunting in the new year when Anjali’s 70-year-old father suffered a heart attack. What followed were frantic hospital visits and a soaring medical bill. With this unexpected load of expense, the couple’s home buying plan got postponed. Their hopes of saving as much as Rs 2.67 lakh through CLSS also seemed to crash as the scheme was valid only till 31st March 2019. To first time home buyers like Sanjib and Anjali, the news of the CLSS scheme getting extended for one year has brought a smile of relief. Given the positive performance and growth of PMAY CLSS, the government, on New Year’s Eve 2018, extended the Credit-Linked Subsidy Scheme for MIG homebuyers by a year until 31st March 2020. 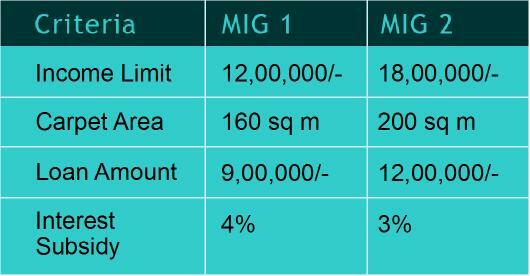 However, for those who are still not aware of the PMAY CLSS scheme for MIG homebuyers, here’s all you need to know. What Is the New and Improved PMAY CLSS Scheme for MIG Homebuyers? The Credit Linked Subsidy Scheme (CLSS), under the Pradhan Mantri Awas Yojana (PMAY), is the Government of India’s home loan subsidy scheme that offers incentives for construction or buying homes. CLSS for MIG homebuyers, in the first phase, was valid for a period of 12 months, ending on December 30, 2017. Later, the government, reviewing the success of the scheme, extended it until March 2019. The scheme offers 4 percent interest subsidy on home loans of Rs 9 lakh for a 20-year tenure, to MIG 1 beneficiaries with an annual income ranging from Rs 6 lakh to Rs 12 lakh. MIG 2 homebuyers, having an annual income of Rs 12 lakh to Rs 18 lakh, will get an interest subsidy of 3 percent for the same loan component and tenure. In November 2017, the carpet area of a housing unit eligible under the CLSS was revised to 120 sq m for MIG I, and 150 sq m for MIG II. In June 2018, the government further revised the carpet area, enhancing it to 160 sq m for MIG I, and 200 sq m for MIG II. To take advantage of the Credit-Linked Subsidy Scheme for construction, re-purchase, or acquisition of new homes, MIGs will have to avail the home loan from a registered finance company or a bank. You can contact us for detailed guidance on how you can avail of the benefits under PMAY CLSS Scheme for MIG homebuyers. On February 20, 2018, the Union Cabinet approved a National Urban Housing Fund for Rs.60,000 crores to fund the central government’s flagship programme – ‘Housing for All by 2022’ – which aims to build 12 million affordable housing units in urban areas. The government will raise the National Urban Housing Fund from non-budgetary sources and will place it under the Building Materials and Technology Promotion Council, an autonomous body, whose primary exercise is to identify and implement new technologies to fast track construction. Pradhan Mantri Awas Yojana mobilized Rs. 8,000 crore from the National Urban Housing Fund in FY 2017-18, and secured an approval to raise Rs. 25,000 crore in FY 2018-19. Till this date, PMAY (Urban) approved 68.7 lakh houses, out of which, 13.5 lakh houses are already completed, and 37 lakh houses are in different stages of construction. The government, under the Credit-Linked Subsidy Scheme, has credited a sum of Rs 7,543 crore as interest subsidies on housing loans to 3.39 lakh beneficiaries, as of December 31, 2018. According to real estate market analysts, the 12-month timeline extension of the PMAY Credit Linked Subsidy Scheme for MIG until March 31, 2020, will not only help the homebuyers, but it will also boost the construction sector throughout the country.